I know this is random, but I just wanted to mention that I LOVE the new Heinz ketchup packets. So far, the only place I've seen them is Chick-fil-A. These are the greatest. 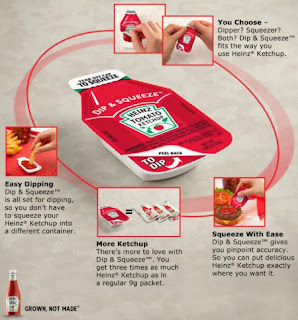 No more squeezing pack after pack of ketchup onto a napkin or hamburger wrapper. It leaves me thinking, "why didn't I think of that?" Can I tell you how much I LOVE these?!?!?!?! I just had lunch at Chick-fil-A, this was my first time seeing them, I loved it!